The iPhone 6 and iPhone 6 Plus are without a doubt Apple’s greatest smartphones to date, and with a thin profile of just 6.9 and 7.1mm, respectively, bringing these devices to life wasn’t a walk in the park. And Apple’s design and engineering team had to make use of very limited space to squeeze everything into one place, but that came with a trade-off, apparently, that might leave iPhone 6 Plus users thoroughly disgruntled. Earlier today, we started hearing reports from users that their iPhone 6 Plus devices were being bent out of shape when placed in their pockets. And the sad thing is: we’re not making this up one bit; it’s actually happening and there are several photos floating around on social media to prove it. It somewhat makes sense too why this is happening, considering that Apple had to go extremely thin on the rear casing of the device itself to maintain a very slim profile, and when that very same shell is stressed beyond its specified limits, it starts to experience a bending routine. It is important to note here that something similar has happened last year too when iPhone 5s users started to experience the same thing – seeing their smartphones bent out of shape when taken out of their pockets. The takeaway advice here: don’t stress your smartphone to the point where you’ll know it would be damaged, and it’s best to keep it inside a hard case to make it bend-proof. All devices have their weakest points, and if you push or apply too much force on that point, it is bound to bend or break. The iPhone 6 and iPhone 6 Plus has seen record breaking sales for Apple. With 4 million pre-orders in 24 hours and 10 million devices collectively sold in just three days after release, the devices are a massive hit in the market. This why “cheap junk plastic” is better than metal. Because it doesn’t bend, it just cracks. LOL. 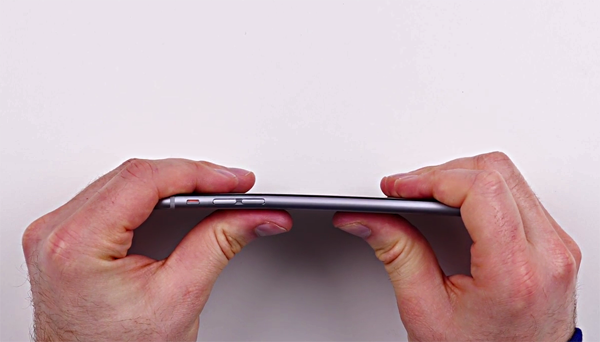 Also iPhone 6 plus bends because it’s too thin not because of metal. I think you are wrong as plastic wants to return to its original shape. But we will know soon enough since Apples crappy body design has established a new test for large smart phones and we will see soon how the note 4 or note3 compares against the 6 plus in the bendgate controversy. Before you post such absolute nonsense YOU might want to take a look at the test the same person did on the Samsung Galaxy Note 3. Spoiler Alert: It Survived – Completely In Tact. Wrong analogy. More like stupid mercedes falls apart when you adjust your seat. iPhone 4 was the last “premium” phone. iPhone 5 and 6 are junk. but wait… jony ive the sir said clear and loud that “IT IS PERFECTION”. lol at you isheep. maybe iphone6 can be bended. but….will it blend? Thank god I started with 4S and buy S model every couple years. I’m gonna buy 6s with bendgate fixed and 2GB ram. What is the point of buying a scratch resistant slim phone if u still has to use hard cases ? Solution: use a case like in the iPhone 4 antennagate. So, what’s the meaning of “ultra-cool” design if it require a case?? Sure, by “the thinest iPhone” then slap a big, thick case on it so that it does not break! You Apple buyers should get youre head checked! Right, sure you can find an excuse! But are you supossed to drive into a wall? Ooo, wait, I know, you are not supossed to put the iPhone in your pocket! I sense a hint of JEALOUSY. You missed the point. Everything has it’s limit. Your credit cards are designed to go in your wallet, but if your wallet gets full, a couple cards will get bent and break when you sit on it. If you wear stupid-tight pants, place a large phone in the pocket of those pants, then bend everything around that phone, it makes sense that the large phone would bend as well. I have a 5 and I wear pants that fit properly, but I still shift my phone to the side before I sit down so that it won’t be under pressure. Maybe, as a structural designer, I consider these things in ways that other people don’t, but it makes sense NOT to put any device that wide and that thin under too much pressure. I would expect a phone, or a hard drive, or a calculator, or a glucose monitor, or an insulin pump, ANYTHING, in that form factor, from any manufacturer, to be susceptible to damage of this kind. If iPhone 6+ is prone to bending than iPhone 6 that should give another message saying that “don’t squeeze your phone into a tight place” You may like to blame the manufacturer for damaging your phone because you fail to distinguish between waterproof and water resistance but the question remains; does iPhone 6+ bend on its own? If not, then take good care of your aesthetic, gorgeous and valuable device and don’t bend it with your hand as shown in the above clip. I’d say he’s holding it wrong. 😉 but seriously after checking out the spec sheet between iphone 6+ and LG G3, I think I migrate to the LG. Been an iphone user since 2G but Apple seems to just not get it at all. So long Apple. It was a nice run we had. Anyone remember the w880i? The original iphone 2g younger cousin. The first Walkman phone. Amazing design, absolutely revolution in phone design back in 2005-2009ish. This phone used I bend in back pockets. No big issue. Solution?… Don’t wear tight pants like the fonz. 70s are well and truly over bin the skinny pants! Yea these isheeps do enough bending as it is..
My HTC One (aluminum), never bended. Doesn’t really matter Apple-heads will still buy it. On the other hand apple should go back and make the phone a bit more durable for the price they charge. Ever seen those FAT americans with over 200 pounds? They van bend any device! So give the iphone 6 plus to a 80 pound tiny japanese teen. No way to bend it! Eat sushi, avoid junkfood! You are not an engineer, if you fail to follow very simple usability guidelines. Everything revolves around PEOPLE, not objects. You can’t be serious telling people to change their underwear so that your stupid design won’t break in their pockets. LOL at you. What you’ve just said, it is very stupid. What’s the point of bragging up how slim something is if you have to put it in a case which will result in its being fatter than most other available smartphones? Your defense doesn’t make a lot of sense, either– it’s good that it’s thin so that the required case won’t be as big as it would be if you had a phone that just didn’t bend in the first place? The irrational apple devotion is absolutely bizarre. No! It’s thin so it can fit in a somewhat thinnner case! It’s good that it’s thin so that it will fit in a fat case that will cure the problems caused by its being so thin. Duh. Nope. You have to design so that it survives a specific range of intended use. If you design it to withstand more, you’re over-engineering it and wasting money/resources. If engineers didn’t design to a product’s intended use, but to “anything it might encounter”, cars would be indestructible and no one could afford one. I can also pull a flip phone apart with my bare hands. Does that mean they sucked in their prime? Or what about a DS? I can also slam it on the wall, and it breaks….total garbage, these items. If i drove a “van” over anything, I can bend it too. Why state the obvious? Ok, you got me. But wait… isn’t iPhone a “premium” product? Whatever happened to stainless steel they used in iPhone 4? This is just blown out of proportion. I mean, HEEELLLLOOOO!!! !, you buy a 5+ inch screen phone and expect to be able to sit down with it in your pocket? Come on people, that can happen with any phone that size. Stop complaining and get a damn rigid cover for the $900 dollar phone you just got!!! Every time a new iPhone comes out, there comes the bickering, over and over again, always expecting the perfect phone. Newsflash people, the perfect phone does not exist. It’s pretty rare that you don’t see someone putting their iphone in a case. With it being thinner, it allows you to customize your phone while still having a thinner profile, even with a case. you are so stupid……. there are alot of phones with samesize screen or even bigger and you can sit down with it in your pocket and it will not bend, the iphone is just junk…. That can’t be true; they’re very expensive and chic. It’s an absolute piece of garbage which even has a shape which is design to slip out of your hand and crash to the floor.